On our last night in Rakkar, we hung out on the balcony at Ghoomakad with friends and made music. When we'd trekked up the mountain a few weeks previously, Foja hummed and whistled a tune that was an earworm. I was really glad that it was played that night with the lyrics explained, too. It's a Gaddi herder's folksong about the difficultly of long distance relationship in the Himalayas. Essentially, "You're from the next ridge, this love is over." I got two videos of the song. Shot in the dark around the big slate table lit by a single bulb you can barely see Foja at all, but Christian is visible playing guitar in one and melodica in the other. I wish I'd filmed some of the other songs from that night, but this one was the one I really wanted to remember. The camera pans around, the audio quality is poor but it captured the tune and the moment. There's a page of Gaddi folk music with lots of songs in case you want to hear other local tribal tunes. I am enjoying life in Bangalore. We've been here for three weeks. The traffic is dreadful and the mosquitoes plague me, but this city is full of people I love. Having friends somewhere makes the visit rich and wonderful. We're staying with Shreyas and Arun. I'm not sure how to appreciate them properly. 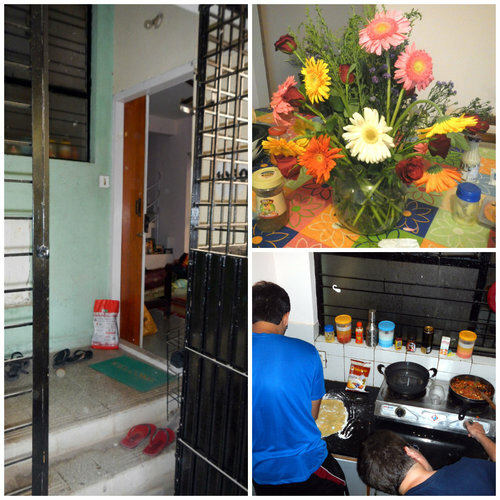 They are terrific guys who tolerate - even encourage - our experiments in their kitchen and my DIY projects. Their place is always called Home with the capital H obvious from the way it's said. We are Home. It is good. People in the neighborhood are getting used to us. The guys at the vegetable cart down the road help me find the nicest beetroots. The guards in the apartment building wave hello as we return from our shopping. The other night I held a puppy at the supermarket while its owner was checking out. Shreyas's housekeeper asked Tod where I was when I was off at HasGeek one morning. Today I finally spotted the rodents that live in the garden and eat the compost and scraps. We'll leave Bangalore tomorrow. This might be the first time in a long time I haven't been ready to return to Tokyo after a long journey. I will truly miss Home. This is more of a Spin Matsuri post than one for Mediatinker, but in the interest of keeping my travel journal full, I can tell you about the personal side of attending a tech conference as a circus person. That's what I call myself these days, when people ask. "I'm a circus person" or sometimes "I'm a circus performer" even though I don't perform all that much. And then I launch into an elevator pitch about social circus. 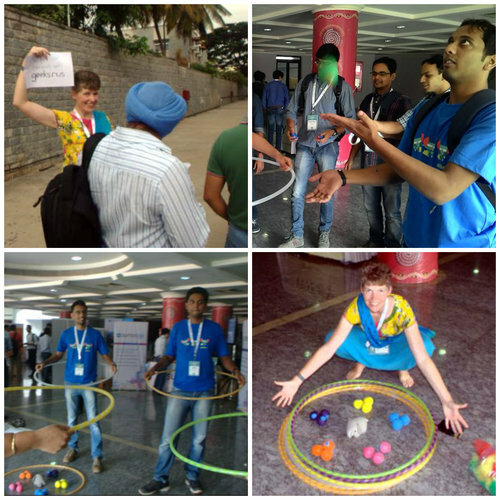 Anyway, I was asked to perform at the event, but that morphed into me leading some Stretching for Geeks sessions in between talks and doing two circus playshops. I made juggling balls and brought hoops and scarves and it was great fun. In fact, there are eight new jugglers in the world now. I'm really proud of the guys who came and played and practiced until they got it. Having run and organised plenty of events myself, it was interesting to see how it is done here, by my friends at HasGeek. There were about 1000 people in total, with a two track, two day program and vendor booths, too. There was lots of networking time and space for everyone. They had an epic lunch setup with interactive buffet elements like a freezing cylinder that made kulfi, salad bar, tons of veg and non-veg buffet options and live cooking. I ended up with the lunch boxes both days (since I was circusing during lunch time) which were also tasty. In addition to circusing, I spent both mornings greeting the attendees outside the venue and directing them to registration. That meant people knew my face and came to me with questions and problems. Even though I was a last minute addition to the team nobody knew that! So lots of times I had answers and sometimes I didn't. I also got up in front of the 800 seat auditorium to make announcements and moderated and impromptu flashtalk session when one speaker had to cancel. I had a lot of interesting conversations with attendees and staff, received many compliments about my ability to keep the enthusiasm going, got a couple of job offers, and made some possibly useful connections for my social circus activities. All in all, The Fifth Elephant was a great event, even for a circus person. Zoupi enjoyed it, too. While staying at Shreyas' place, I made six beautifully hand-crafted but torn cane chairs useable again with painted plywood seats. They aren't fancy, but you won't fall through them. I measured the chairs and went to Workbench Projects to use their tools. We carried a sheet of plywood through Bangalore traffic from the nearby supplier - that was fun. Actually, everything at Workbench was fun. It's bright large and neatly organised! The staff are great and we all juggled together. If you need to make stuff in Bangalore, you should go there. They have hand and power tools, 3D printers, and a co-working space, too. Back home, I painted the cut plywood with a creamy colored enamel and let it dry for many hours between coats. Then, uncertain how best to attached the seats to the frames I'd pulled all the can from, I opted to simply sit them there. Glue will ruin the chair for future reworking and the holes from the caning make nails and screws impractical. Not content to merely be the best host in Bangalore, Shreyas drove us out to Mysore to see this historic town and meet his good friends. We stopped at Somanathapura to see a beautifully carved 750 year old temple. 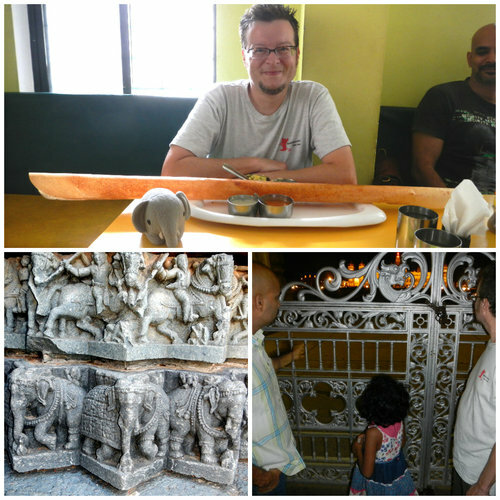 We ate well and Tod had an especially memorable paper dosa. We went to an art museum that houses a collection of instruments and games on the top floor, and enjoyed the paintings, sculpture and artefacts even when the power cut out. We saw the palace lit up at night. I made a new hooper friend in Avani. And we grownups talked about education and plans and all sorts of good stuff. My bad moods can be turned around by drawing on my body. In this case, my crankiness stemmed from a frustrating visit to Pune where absolutely nothing seemed to work out as planned: our accommodation was creepy; the friend we were visiting had to work; the parks I wanted to visit were nonexistent or closed due to timings; the day was very hot. It all turned around when Tod connected the dots of my mosquito bites into an elephant. 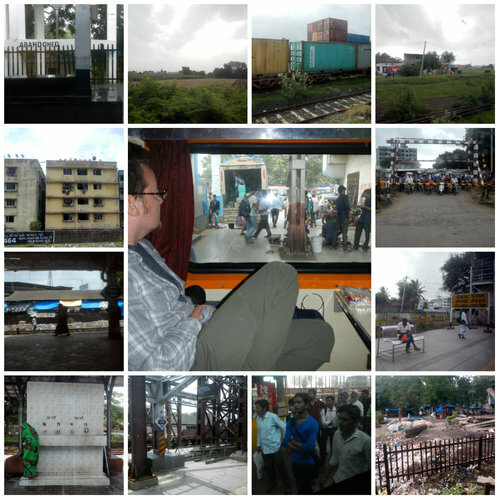 The overnight train from Bhuj to Mumbai was like a 16 hour movie. So many scenes out our window. We passed urban junctions full of commuters rushing for the open seating cars, rural pastures full of cows, people living with piles of garbage, derelict buildings crenelated with dish antennas. Once we got to Mumbai, we switched to another train and enjoyed the constant flow of snack vendors running up and down the aisles. Chili pakora? Yes, thanks! Chai, sweets, tomato soup, sandwiches, phone chargers, bangle bracelets, toys...it was 3 hours of shopping opportunities. 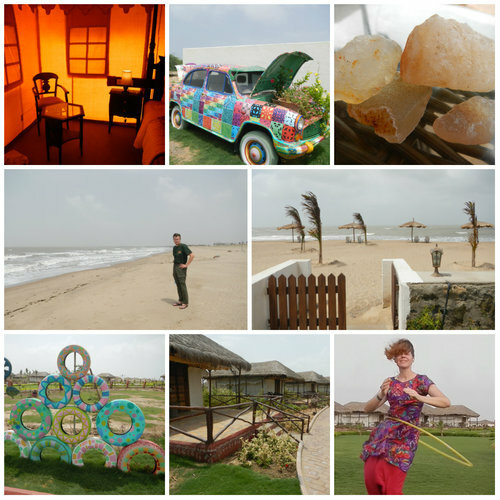 Mandvi Beach Resort - hot, windy and dry like a desert with an ocean next door. After hillhacks and trekking in the mountains, we decided to visit some friends in different places around India before heading to Bangalore. I'll say this was the least good part of the trip, but reviewing the photos and recalling the moments, it was never actually bad. I had expectations that weren't met so the period is framed by those expectations. Our short stay in Ahmedabad was hotel bound. It was just too hot to be outdoors much. I didn't get any sense of connection in Ahmedabad; no expansion of our social circle or feeling that we ought to return. I'd hoped to...I am not even sure. Meet some people? Do some sightseeing? Instead, we hung out with a friend who came over to the hotel with his portable WiFi. He also made sure we ate all the best Gujarati street foods - fried pav bhaji, butter buns with jam and cheese, ice cream and pineapple sandwiches with grated cheese on top. There's a famous dairy, Amal, in the city and everything is coated with cheese and butter. We also had some delicious Gujarati thali - basically a buffet that comes to your table in a flurry of service. The jaggery-sweetened curries and gravies were delicious. Another unmet expectation: fish. We took an overnight bus (which broke down somewhere outside Gandhidam so ended up being three buses) to Mandvi beach so that I could satisfy a seafood craving but Gujarat is so vegetarian that fish and meat never appeared on any menu. The beach resort where we stayed was quiet and lovely in its off season. It was relentlessly windy and hot so we enjoyed the comforts of our air conditioned luxury tent and took short walks on the beach. We played Mastermind, chess, and tried to film the WHD Dance. After constantly being with friends and groups, this was three days of time alone with Tod and it was delightful, even if there was no fish.